Over the years, we have tried plenty of products that were designed to reduce odors and work towards keeping bedding dry. Some worked moderately well, others not at all. Here are some of the product claims and we thought it would be just as easy to include the product claims and then add our experience and notes next to each of them. Keeps horse stalls dry and smelling fresh – True. The fresh smell comes from a variety of organic materials including seaweed and essential oils so the smell is incredible. And…the smell lingers and lasts in the barn for awhile! In addition the combination of the products in Stall Fresh do a phenomenal job of ‘wicking’ the moisture away and dispersing in the air. Why does that matter? It helps reduce the costs of bedding because the stalls stay drier. Neutralizes harmful gases from manure and urine that irritates your horse’s lungs – True. 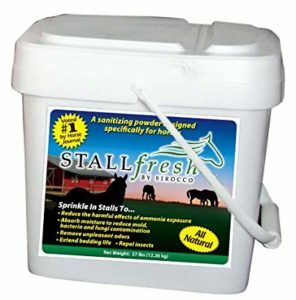 We noticed a significant reduction in the smell of ammonia once we began using Stall Fresh. We all know that heat and humidity and a barn that is more closed up in the winter months, can increase the smell of ammonia and other harmful gases in your stalls and facility. Repels insects, parasites and insect-born diseases – True. While we can’t claim to have noticed significant reductions in insects, we did notice fewer insects and parasites. With it’s ability to wick away moisture, there are just fewer places for disease carrying insects and parasites to call home in the stall. Extends bedding life and reduces bedding costs – True. We noticed a reduction of about 10-15% in the amount of bedding we use each month. Again, the bedding stays drier between cleanings and that makes a huge difference. Only bedding conditioner on the market with essential oils (eucalyptus) – True as of 2018. We have found no other product that contains essential oils. Some contain fragrances but there is a significant difference between fragrances and essential oils. Essential oils condition the hoof, preventing excessive drying of skin and hoof – True. The proper and good quality essential oils can condition the hoof and promote healthy hoof and skin growth. We have never had any drying skin or hoof issues and our farrier will tell you, we have some pretty healthy hooves in our barn! Essential oils relieve your horse’s anxiety, irritability, and restlessness – Absolutely TRUE. I am a Certified Clinical Aromatherapist and have worked extensively with essential oils and people AND horses. Again, the right essential oils (pure & not-adulterated) can significantly reduce irritability in anxiety and restlessness. They can also promote a health immune system, reduce inflammation and so much more. It’s important to note that the essential oil industry is NOT regulated by the FDA so essential oil companies can say and print anything they want about their essential oils. Unfortunately many times those claims are not true. Things like “100% therapeutic grade” or “medical grade essential oils” are all marketing jargon. I teach Aromatherapy and do not sell essential oils but I have several I highly recommend and it’s important to note, I receive no financial or other compensation for recommending these oils. I have researched them, looked at a variety of testing, claims, etc., and I know what’s good and more importantly…what’s not. All-natural, non-toxic, and organic materials – True. This product can be applied with your bare hands and your hands actually feel moisturized after the application. It’s important to note that we do not and will not receive any financial or product compensation from the makers of Stall Fresh for this review. We’ve just been using it for a long time because it works for us and our horses! This product is available at a variety of the big name stores like Dovery Saddlery, Schneiders, Dr Foster & Smith. It is also available from Amazon and in the spirit of full disclosure, Horse Family is an Amazon Affiliate. We have included a link to Stall Fresh at Amazon Affiliate link below. Should you purchase from there, we will receive minimal compensation as an Affiliate. With that in mind, we encourage you to purchase from whomever you’d like because this is a great product that will make a difference to you and your horses!